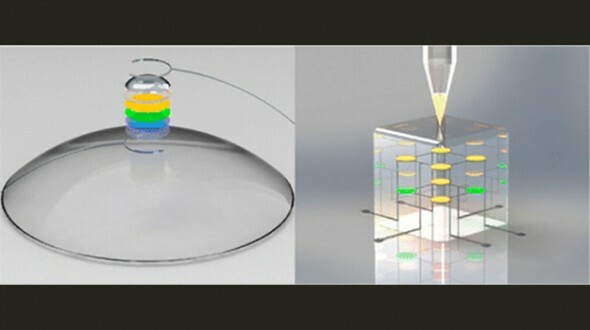 University of Washington researchers have used a 3D quantum dot LED printer to fabricate a contact lens with built-in information displays. By breaking the concept of an LED down to its most basic form, the researchers saw that they needn’t think of LEDs as little domed plastic lightbulbs, but simple stacks of interacting material. This printer can lay down an LED with a sandwich structure that’s not unlike any single pixel in an OLED display — you’ve got an emissive layer (in this case nanoparticles of cadmium selenide generally referred to as quantum dots) sandwiched between one layer that can donate electrons and one layer that can accept them. The whole thing can be fused to a surface thanks to the bottom adhesive layer, which is activated with UV light. Best of all, these printed LEDs are ultra-thin, flexible, and almost totally transparent! The pixels in a contact lens display can take one of two forms. The active approach, exemplified here, uses each pixel is a light source, emitting photons into the eye and creating an image directly. The passive approach would use far less power but would be much more difficult, using each pixel to bend incoming light from the environment to cast a new picture onto the retina. The problem with the active approach is that it requires a fair amount of power to keep running, and wireless power collection relies partially on the physical size of the collecting antenna; when that antenna must be physically fitted inside a contact lens, it imposes a hard upper limit on power supply. Science fiction readers have had the benefit of several decades of advance notice for these devices. Take a look at the DreamTime Scleral Contact Lenses from Larry Niven and Steve Barnes's 1992 novel California Voodoo Game and more recently the smart contact lens from Vernor Vinge's 2001 story Fast Times at Fairmont High and of course his more recent novel Rainbows End.